Where to start with your migration to ConvertKit. Switching email providers can be a lot of work, and we wanted to alleviate as much of the stress as possible, so that you can move over seamlessly and quickly. Replicate the Subscriber Forms and sources. Match Sequences to Forms and Tags. Replicate any automations (product purchases, etc). Replicate Tags in CK to match lists/tags in old provider. Create new Segments in CK. Switch blog Forms and Subscriber sources to CK Forms. Import Subscribers to match Tags in CK. Let's cover each one individually, and then we'll also point out some of the main ways ConvertKit features differ from other providers. (Yahoo!) Reading this is also a great way to understand the core functions of the feature set, and how to get started in the best way. A Subscriber opts in through the sidebar Form. Optional content upgrade via file or url link. Begins follow-up Sequence (also optional). They are added to a "buyer" Tag. A Subscriber opts into your content upgrade Form. Content upgrade via file or url link. 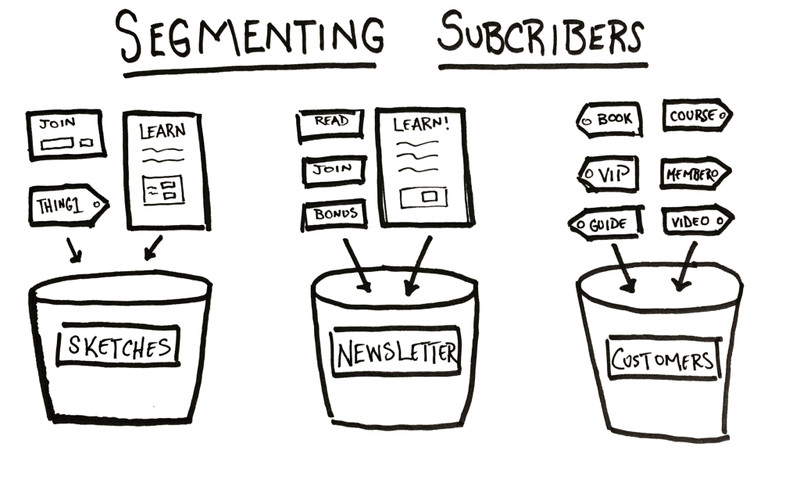 Basically, each new Subscriber or customer goes through a specific funnel, and we need to know what they are. To help clarify the funnels we created a spreadsheet that lays everything out. If you want to speed up your migration, fill out this sheet with each Form and Subscriber source on your site. Click here to view. This is a public Google Sheet, so you need make a copy for your funnels. The next step is diving into the main point of entry for any new Subscriber Forms. You can create a Segment that gathers Subscribers in all applicable Forms and Tags. For each Subscriber source funnel, you will create a specific Form to start readers on their journey. You still need to create a Form to "catch" the Subscribers in ConvertKit. What you don't need to worry about when connecting with a lead generating service is the designed content of the ConvertKit Form. You only need to match the fields (first name, email) in the ConvertKit Form with the fields you're requesting with the service. NOTE: you don't need to create specific Forms to connect with the lead gen service. If they are going through the same funnel that is set up with another Form, you can use it here too. You can connect a Sequence to a Form like this. You can also start a Sequence on a specific date if you like. There is a default "Thank You" page in ConvertKit, but we highly recommend using a page on your own site, to stay consistent. This can be selected as the Success Redirect URL in the Form's main settings. 1. File Download: We simply upload the file in the action box below the email text. Easy! 2. Success URL: Click on the URL button next to the upload file option. The option will flip and we will paste the URL there. A great option for existing content you want to keep leveraging. Whatever (MailChimp) automations, (Aweber) autoresponders, or (Infusionsoft) campaigns you have, it's almost always a matter of copy and paste. The process is not hard, but can be tedious, depending on the number of Sequences that need to be migrated. A couple things to take note of. ConvertKit schedules Sequences based on days since last email. MailChimp and Aweber do the same. Just match the schedules. The ConvertKit Editor can handle header images, inline images, and hyperlinks. More on creating a custom template here. NOTE: We find that emails deliver better and have higher engagement when they are written like emails to friends, not when they look like mini-web pages. Match Sequences to Forms and sources. Reader Subscribes to Form, starts a Sequence. A person buys a product on Gumroad, starts a Sequence specifically for buyers. A reader in your pitch Sequence buys the product, and is taken off the pitch Sequence and added to the buyer Sequence. If you're coming from MailChimp or Aweber, you probably don't have any, and that's one reason you're coming to ConvertKit! Each list in your old provider will become a Tag in ConvertKit. We simply copy the old list name to the new Tag, export the data, and import to the matching Tag in ConvertKit. That's all! Of course, that's easy for 5 lists or Tags. The more lists, the more tedious and time consuming the process becomes. If you can consolidate your Tags, this is the time to do it. We referenced this in the Form process, but Subscriber organization works much different on ConvertKit than other services. ConvertKit is Subscriber-centric, while MailChimp and Aweber (along with most others), are list-centric systems. Think of segments as different buckets that Forms, Landing Pages, and Tags are dropped into. Here's a quick visual sketch of the idea. In ConvertKit, you are not charged for duplicate Subscribers. Just another perk of our Subscriber-centric platform! Now you will go to each Form on your blog, and switch it to the new ConvertKit Form. Do the same for each source with a lead gen tool (LeadPages, Optin Monster, SumoMe). If you're simply using Wordpress and ConvertKit Forms, please read this article. This is where your funnel map is very useful. Simply go down the list and start checking them off! This is the last step, even though it's fairly easy. The reason we wait until the end to import is so we don't miss anyone in the process of switching everything. Switching the web Forms to ConvertKit is essentially turning off the Subscriber flow to your old provider. Now we know the lists are accurate and it's safe to import them to ConvertKit.